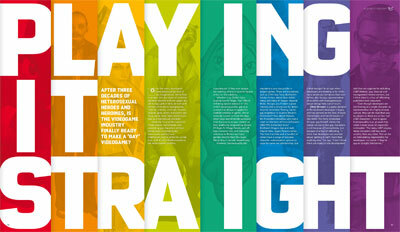 According to the fabulous folks over at gaygamer.net, this month's issue (#218, with Kinect on the cover) of Edge magazine features an in-depth article--titled "Playing It Straight"--about LGBT characters in video games. I can't tell you anything else about the article, unfortunately, as I don't live in the UK and the article hasn't been posted to the magazine's website, but hopefully the latter will change sooner rather than later. When (if) that happens, I'll let you know. That's awesome! Keep us posted.